Number 1: Camden Rams celebrate their 14-12 grand final victory over Picton Magpies on Saturday night. The win avenges last year’s grand final defeat at the hands of the Magpies, who won three consecutive premierships. But Rams made sure it did not become four in a row with a massive defensive effort, especially in the last 10 heart-stopping minutes of the match. 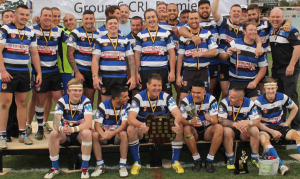 The Rams made history by winning all four matches they contested on Saturday at Campbelltown Stadium, with their League Tag, Under 18 and Reserve grade teams also claiming victories. The first grade match was a dour affair, with only two tries apiece being scored in the 80 minutes. The Rams’ defence was the highlight, with the Camden side holding firm despite Picton threatening to score on several occasions. Camden winger Mahn Darley opened the scoring after 17 minutes, and another try minutes later saw the Rams skip out to a 10-0 lead. This was to the delight of the Camden fans who had made the trek on Narellan Road to support their teams on Saturday, starting with the League Tag grand final at 12.30pm. The Magpies however weren’t done yet, and continued to apply pressure to the Camden line, but their defence held strong for large periods of play. Picton’s lone first half try came through five eighth Don Thompson, who scored the morale boosting four pointer on the stroke of halftime. The teams went to the break with Camden leading 12-6. Camden captain Chris Browne added a penalty goal early in the second half giving the Rams some breathing room at 14-6, but the game was far from over. A try to the Magpies with 17 minutes left gave the travelling Magpie army hope at 14-12. Most of them would have fervently believed it was only a matter of time before their team would gain the lead and go on to win a fourth consecutive premiership. But Camden’s defence in the last 10 minutes was quite impressive, absorbing a mountain of pressure from the Picton lads. Camden sealed the win with a penalty goal in the final minute. Their five eighth, teenager Zac Greene, was named best on ground, and few would have argued with the decision. Greene, along with halfback Jackson Willis, steered the Rams around all night with great class. Greene and Willis were among the best for the Rams, along with second rowers Toby Huxley and Matt Applebee, while Dean Collis’ experience in the centres was invaluable, along with lock Dean Rysko, who made several damaging runs throughout the night. Picton’s best included Jack Twist, Don Thompson, who terrorised the Camden defence all night, Kenny Ahovelo and Jason Thompson. 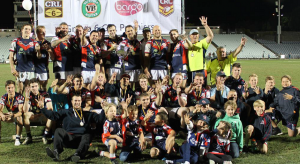 The Appin Dogs celebrate their Second Division 28-10 grand final victory over the Moss Vale Dragons on Saturday. League Tag – Campbelltown City 10 Camden Rams 12.